Given there were three games ending in golden point last weekend, it’s fitting all of The Roar’s NRL expert tipping panel are separated by just a single point after a month of footy. Whatever your opinion on golden point, it made some pretty awful games turn out okay – that Panthers-Tigers one on Friday night being at the top of the list. AJ picked up six tips last week (and if anyone got eight, tipping Manly to beat the Rabbitohs and every other game along the way, congratulations to you), but it means we are all very close on the leaderboard, with The Crowd getting four and everyone else five. As it stands, Stuart, The Barry and The Crowd all have 20, while AJ and myself are on 19. 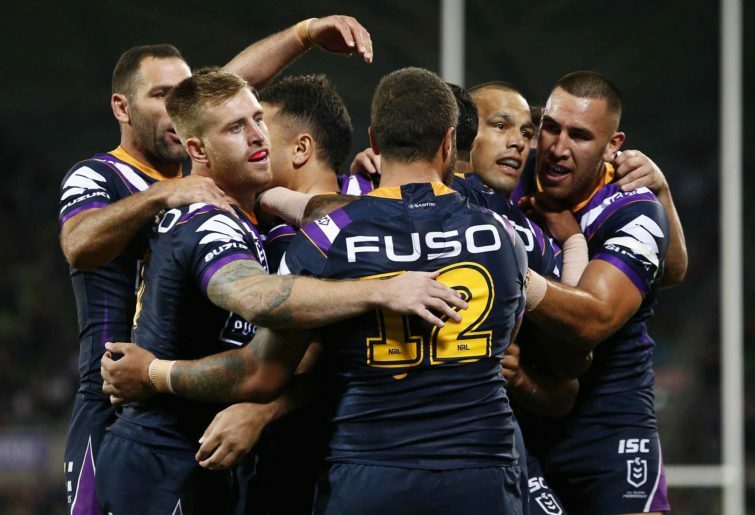 Round 5 will get underway in Brisbane with the battling Broncos and their woeful defence taking on the Tigers, where the wheels look to have fallen off the wagon – or is that the bus? Friday takes us an hour south and 20 north as the Titans host the Panthers in a game which, based on last week’s performances, may not be worth watching (so I can’t wait to blog it), before the Cowboys take on the Storm in a game they simply must find a way to win. South Sydney open Saturday’s action with the fourth game in Queensland on the Sunshine Coast, before action finally moves south, as the Knights host the Sea Eagles without Tom Trbojevic, and the banged-up Sharks look to christen the 100th* new name on their stadium against the Roosters. 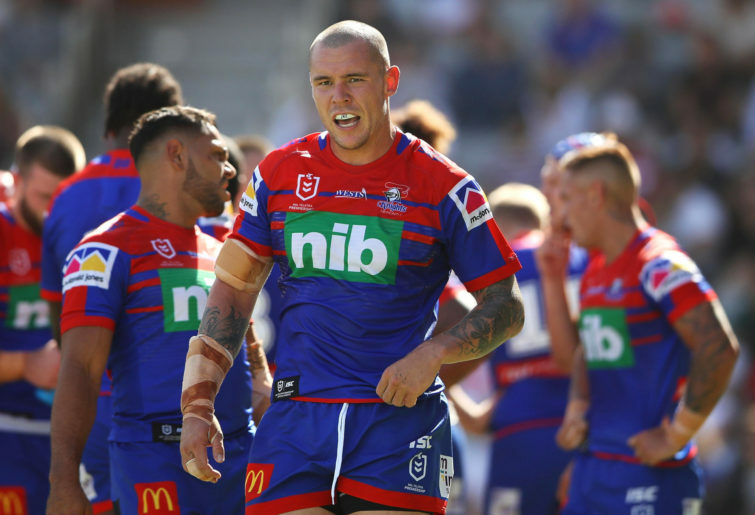 The Dragons will then look to bury a hoodoo of sorts on Sunday when they host the Bulldogs at Kogarah (keep in mind the Bulldogs dished out a massacre at the same venue late last year) before the Raiders and Eels close the round in a battle of the surprise packets. 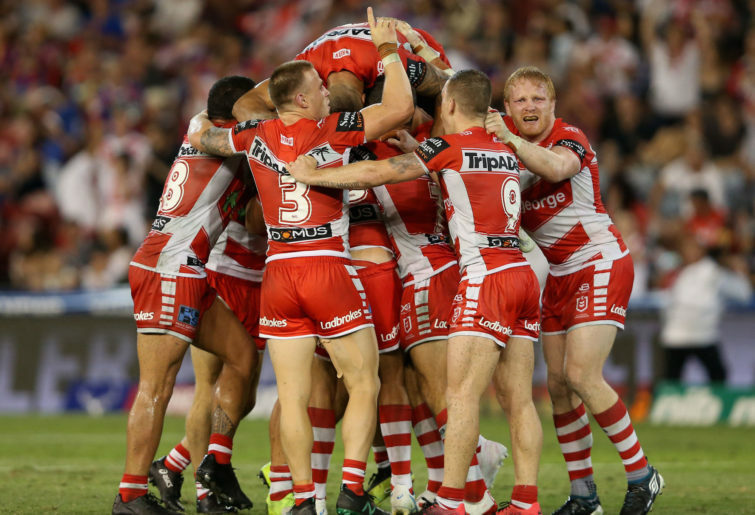 Don’t forget to join in with your tips at the bottom of the article to try and beat the experts in 2019 as The Crowd and try your luck in our Roar NRL tipping comp. Crowd tips will close at approximately 5:30pm (AEDT) on Thursday afternoon. Given AJ is finally back into some tipping form, we had better kick it off with his thoughts for this weekend. You thought I was out of it? Ha! Here I come, baby! The champ doesn’t stay down for long. You’ll want to be hitting copy and paste for the next few weeks if you’re interested in winning your tipping comps. The Tigers will sneak a win in Brisbane. They’re better and they will be annoyed at tossing away a certain win last week. Penrith will beat the Gold Coast and it won’t be a game worth watching. In the other Friday game, the Storm will have a battle on their hands with the Cowboys, but Melbourne will win – although only just. On Saturday, Souths will beat New Zealand, Newcastle simply must beat Manly without Tom Trbojevic if they’re serious about the season and the Roosters will take care of a dinged-up Cronulla. Two belting games on Sunday to finish the round. Dragons will get the Bulldogs after another tough fight before my beautiful Raiders will end all talk of a Parramatta resurgence. I watched the worst NRL game for sometime on the weekend as my Wests Tigers got beaten in golden point and I landed the tip as consolation for sitting through an error-riddled match. The overall tipping result was again mediocre with another five. No one wins the comp with a five-point average. Brisbane and Wests have been very disappointing in the last couple of rounds despite coach Maguire talking up the Tigers performance against Penrith in the post-match press conference. 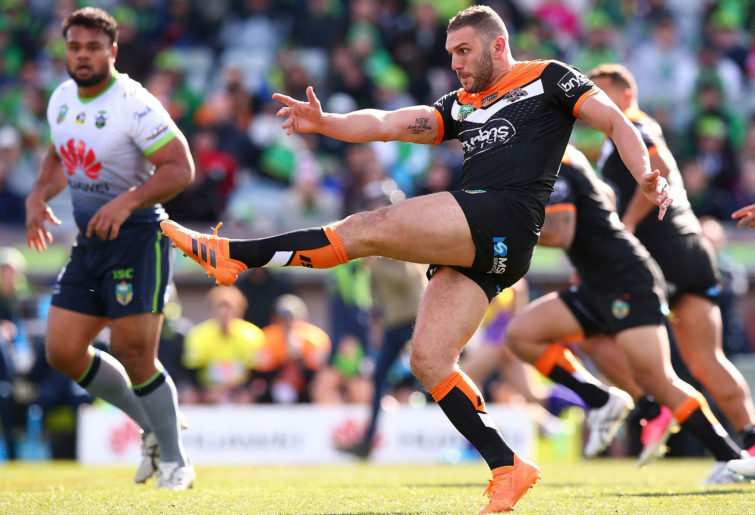 TPJ is suspended and the Wests Tigers have made some changes in the forwards. Both teams will be looking to improve. Broncos at home. The Panthers were pretty ordinary and full of errors last-start despite getting a victory, but they have the winless Titans this week. Dallin Watene Zalezniak and Dylan Edwards have swapped positions. Penrith to crawl over the line. The Storm will be too clinical for an out of form Cowboys side lacking a bit of direction and missing Taumalolo. Melbourne. A bit of blip last week for Souths going down to Manly in golden point while the Warriors won, but it was against the Titans. Rabbitohs to bounce back. The Knights have disappointed me every time I have tipped them while Manly got an unexpected win on the weekend. The Eagles have lost Tommy Turbo to injury yet again and it makes a difference. Newcastle at home. The Roosters were very impressive against Brisbane and will continue against the Sharks. Easts to win. The Bulldogs are exceeding expectations lately and so are the Dragons, considering who they have unavailable. Canterbury have lost Napa. A big out. Dragons at home. The last game of the weekend should be a good one with both the Raiders and Eels in form. Canberra have Tapine back, Leipana is rolling and they should be too good at home. Raiders. Two weeks ago, the Tigers were flying high, undefeated. The wheels have fallen off dramatically with their recent performances almost unrecognisable. Not even the return of the great Josh Reynolds and his two try assists could help them out of the mire against Penrith. The Broncos aren’t going great guns, but being at home should get them home. The first Friday game sees another two teams struggling for form. It’s hard coming up with a convincing reason for either. The return of Viliame Kikau helped the Panthers, but he was playing on one leg. I’m going for an upset here and tipping the Titans. Apparently, the NRL flew Hazem El Masri to Melbourne in anticipation of Cameron Smith breaking his point scoring record. El Magic will be clocking up the frequent flyer points with a trip up to Townsville this weekend. Their close call against the Bulldogs will put the wind up the Storm and they’ll win well against the Cowboys. The Rabbitohs are taking their home game against the Warriors to the Sunshine Coast. They could take it to the moon – anywhere outside New Zealand is enough. The Souths backline isn’t looking as strong as it was, but they’re still good enough across the park. With no Tom Trbojevic and the Knights attack still misfiring, this will be a low scoring affair. That gives Manly some hope of an upset, but I’m tipping the Knights to get up. 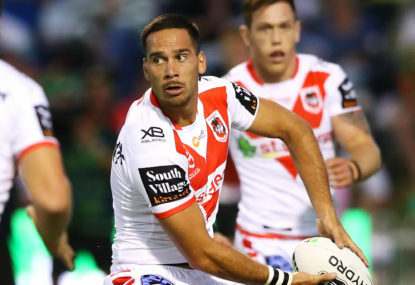 The Roosters were circling in the water last week while the Sharks looked like feather dusters, albeit missing Matt Moylan and Shaun Johnson. Johnson is back, but I expect the Roosters to be too strong. The last two weeks has reinvigorated the season for Bulldogs fans. To take the Storm so close to the wire in Melbourne was huge. It will be an up and down season though and they’ll struggle to maintain that level. Canterbury traditionally do well against this week’s opponent but with the inevitable letdown from last week, I’m reluctantly tipping the Dragons. Who’d have thought a month ago that the Raiders and Eels would be the match of the round? Potentially some queries about the strength of their opposition, but there’s a lot to like about how both teams are going about their business. Raiders. Alright, alright. I know what you’re all thinking. Melbourne fans, put the pitchforks down. Cowboys fans, it’s not a typo. Yes, I’m taking the struggling Cowboys to defend their home ground in Townsville against the Storm on Friday night, simply because they have to. There are no more excuses for Paul Green’s men. They have to find a way to win, and this is the perfect backs to the wall type siege they could pull off if their forwards get rolling, even without Jason Taumalolo. Add to that, the Storm are coming off a five-day turnaround, didn’t look like themselves last week in a narrow win over Canterbury, and have to travel to the opposite end of the country. I can feel an upset. Given we had three golden point games last week, tipping most games this week feels like splitting hairs, so dealing with the rest isn’t straightforward either. In fact, the only game I feel confident in is the Rabbitohs getting over the Warriors. Starting off the round, I’ll take the Tigers over the Broncos. This is a game which could go either way, but the Broncos defence has been unacceptable so far. Last in missed tackles, last in ineffective tackles, last in possession, and now Tevita Pangai Junior is suspended. I know it’s in the Queensland capital, but the Tigers should pick up the win. I’ll take Penrith to get the better of the Titans, who just don’t look like winning a game. At the moment, AJ Brimson is the only player who looks likely to spark anything, and he is on the bench again. It’s hard to tip the Sea Eagles away from home without Tom Trbojevic, so I won’t, while the Roosters should beat a battered Sharks outfit. They get some of their stars back, but the defending premiers hit their stride and won’t lose to Cronulla, even in the Shire. The game of the round could come on Sunday night between the Raiders and Eels. That seems to be a strange sentence to write, given I had them last and second last before the season started, but ah, well, they have shocked me so far. I’ll take the Raiders, based on the fact they are at home and nothing else. My Dragons should get the job done over Canterbury as well, but I’m not confident. They are our bogey team of recent years, costing the Red V finals in 2017 and flogging us to nothing at Kogarah last year. Be sure to get your tips in on the form below by 5:30pm (AEDT) on Thursday, and we will have the results in the table and comments section below. Make watching NRL this season scary good with Kayo. Sign up now.